← Huli Wigmen. Is this a good look? On the way we discuss with the guides how many wives they have. The record is held by the driver. He has seven wives. That is a hell of a lot of pigs. Don’t get me wrong – I am not referring to the wives when I say that. I have never met them. But, by my calculations, the driver’s appetite for wives has cost him 217 pigs. He also has ten children. He is a huge, unkempt and unattractive man, who dominates the competition in the “what’s that smell” event. I feel very sorry for his wives. By the time we get to the village the temperature has dropped to something in the region of chilly, the heavens have opened and it is pouring with rain. Four of the fearless five have rain coats and umbrellas. The fifth member has brought nothing with him, and sadly that would be me. The guides of course have jackets, hats and umbrellas, and are looking smug. They look concerned for me, but not as concerned as I would like. The look on their face suggests that it is my fault for being so stupid. They may be right, but I certainly don’t want to be reminded of that. Finally the driver stands up and offers me his jacket. A wonderful gesture and much appreciated, but I just want to remind you of his first place in the “what’s that smell” competition. On top of that, the jacket is quite old and has clearly never been cleaned. It is standing upright in the corner of the bus, without any visible sign of support. The driver hands it to me. I have no option but to accept. As I gingerly take it from him using just two fingers to touch it, I try to conceal the look of revulsion on my face. The jacket stinks, and has stains all over it. I am convinced that several of his children were conceived on top of the jacket. I put it on but refuse to do it up. As I walk through the pouring rain, I have my hands in the pockets, holding each side of the jacket open in an attempt to air it. But it is too little too late. I have never felt so unclean. When a woman is widowed she chooses several mourners to attend to her. These are usually members of her extended family. The mourners are there to comfort her and look after her until she is ready to return to her normal life. They guard her from the spirit of her husband which may be trying to reach her. Of course, the husband will have had several wives, in which case he may have no desire to reach this one at all. However the widow wears the shawl around her head in an attempt to stop his spirit from recognising her. The mourners too have traditional garb, but a lot less of it. They also have to paint their bodies white. They all look miserable and the oldest woman cannot stop shivering. In one corner there is an example of how the Hulis once buried their men. A small box is made and the body is folded into it. It is then raised several feet above the ground on wooden legs. The most charming feature of all this is that there is a small hole made in the bottom of the box. This is to allow the fluids from the decomposing body to drain into the earth. In this tropical heat it must be quite a downpour. We try not to think about the smell, but the guide tell us the women in the fields don’t mind it. Well, of course they don’t. They already have live husbands who smell just as bad, and they share their hut with pigs. But what are they doing planting their sweet potatoes in the vicinity of rotting corpses? Animals of course are attracted by the smell. In order to keep them at bay a ring of seven sticks is placed underneath. 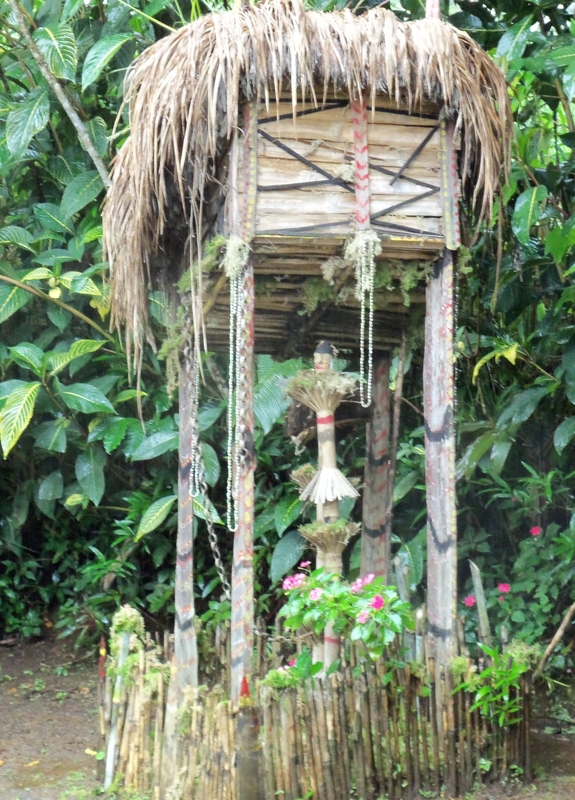 The Hulis believe that this, with the help of the spirits, keeps the scavengers away. I have my doubts, but cannot express them as I am trying desperately not to throw up. 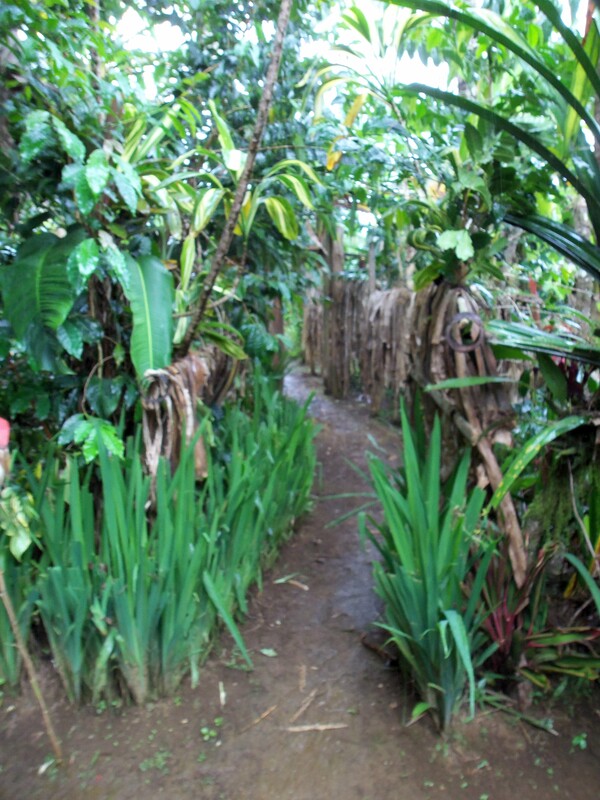 When the missionaries arrived in PNG they persuaded the Hulis that this was a very unsanitary way to dispose of their loved ones, (OK, so they did one thing right), and now almost all members of the tribe are buried. What we are looking at is a mock up of an old grave built solely for our education. That makes me feel much better. I was wondering about the muddy ground around the site and what I had been treading in. A real coffin would have been raised much higher off the ground than this one is, all the better for the putrid fluids to hit the ground and make a large splash. As we are getting ready to leave, I am invited to join the widow and her mourners for a photograph. I am pretty sure that this is done as a friendly gesture, but I check to make sure Gordon is still standing just in case there was another reason for the invitation. I would hate to release his bodily fluids into the ground so soon. Once the photo is taken we say our farewells. It was rather a depressing meeting. The rain and the long faces were not welcoming. 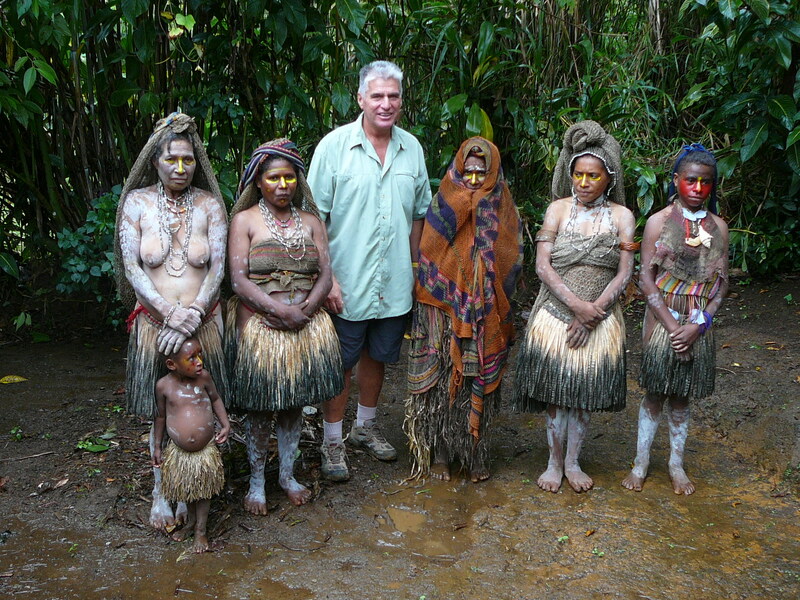 This entry was posted in Papua New Guinea and tagged mourners. Bookmark the permalink. When do you get to take a shower or the rain was it!! What are you eating in this place and we are desperate to know where the “bubbles” are comming from. Can you believe it – no bubbles! Which probably explains the sometimes grumpy blogger.